Recently a serendipitous event occurred. I saw a recipe for Chicken a la King in hundred-year-old magazine, and a left-over chicken breast languished in my refrigerator. My mother and grandmothers often made Chicken (or Turkey) a la King to use left-over poultry – and I suddenly craved this old-time comfort food. The recipe did not disappoint. This delightful dish was both tasty and easy to make. 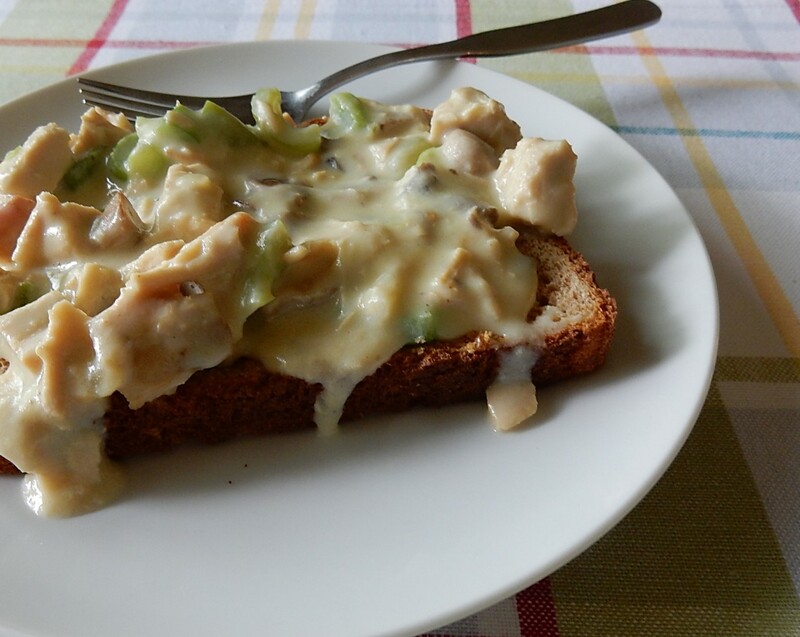 The diced meat was embedded in a lovely thick and creamy sauce that contained mushrooms and green pepper. It is perfect when served over toast, biscuits, rice or pasta. Combine the half and half, chicken broth, lemon juice, and egg yolks in a mixing bowl; set aside. Melt butter in a skillet, then stir in mushrooms, green pepper, and onions. Using medium heat, cook until the vegetables are tender (about 5 minutes) while stirring occasionally; then stir in the diced chicken. Stir in the flour, salt, paprika and pepper. While stirring constantly, slowly pour in the combined liquids that previously had been set aside and bring to a boil over medium heat. Remove from heat. May be served over toast, biscuits, rice, or pasta. Posted on June 19, 2016 June 19, 2016 by SherylPosted in FoodTagged chicken, recipe. It’s fun how this basic dish that uses left-overs somehow ended up with an elegant name. We ate lots of leftovers and still do but I have never made this. Sounds great! I must try it! You should give it a try. It’s quite tasty. I remember eating this over toast. It is a comfort food. It’s definitely an old-time comfort food. I’ve made this dish many times over the years using a slightly different recipe. 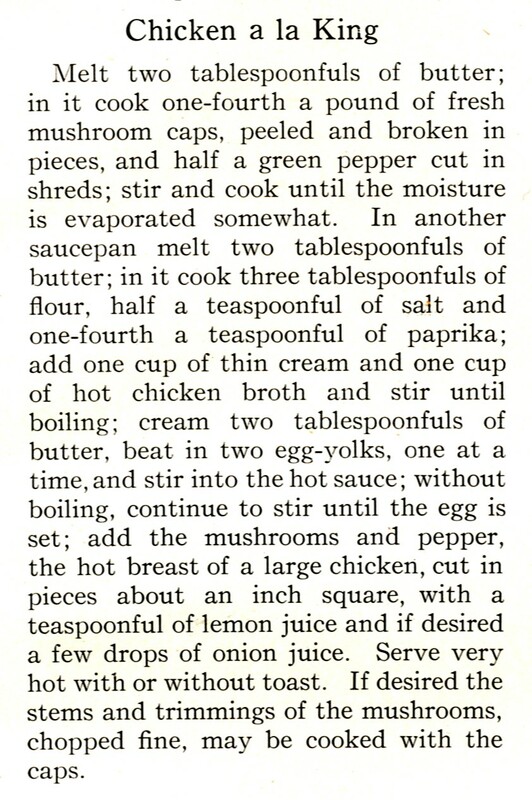 It was fun to see a really old version of the recipe in the hundred-year-old magazine. This is such a good dish, I’m sorry I’ve already had supper — and don’t have any leftover chicken. It’s so good that it’s worth getting a couple of breasts and getting after it. I predict it will be on the table before Friday! Enjoy. . . I’m glad this post brought back good memories of this dish. They sure knew how to make comfort food in the past, and no canned soups, yay! 😀 This looks very good, too. I’d probably prefer it over toast, just like cream chipped beef. I also tend to think of this as a food that would be eaten over toast – but I know that some people prefer to serve it over other foods. Reminds me of SOS which we still make today. My school served this regularly over bread, not toast, and because it was school food I didn’t like it. My mom served it over rice, weirdly. I think I would have liked her version served over bread best! That’s right–a mixed bag, like childhood. You should give it a try. I think that you’d like it. Just in the nick of time! I have some chicken in the refrigerator and plan to try this tomorrow. Your blog is a gold mine! Thank you for posting so many wonderful ideas. I really enjoy your writing. We had chicken a la king yesterday, and everyone loved it. Thanks for letting me know that you made chicken a la king. It’s great to hear that everyone enjoyed it. It’s always wonderful hear when someone makes a food that I feature in a post. Sounds good … Mushrooms and chicken go well together. Thanks for researching this. Chicken a la King has interesting originals. I was surprised how it was served at several impressive hotels in the late 1800’s and early 1900’s. This sounds delicious…wondering if i could omit the egg yolks though? You definitely could omit the egg yolks – just use a little extra flour. In this recipe the primary purpose of the egg yolks is to help thicken the sauce. Over the years I’ve made other versions of this recipe (that were more modern) that didn’t call for the egg yolks and they tasted just fine. Aunt Esther used to make a dish called Chicken Fit for a King. I used to make it when she lived with us in her old age. Once I forgot to add the chicken. Oops! You should make it sometime. In my opinion this old classic has met the test of time – and it’s just as tasty as I remember it. I often have leftover chicken, I’ll have to try this. This is definitely a good one! I will give it a try and feel like I will be honoring a cook from so long ago. I like how you described it. Cooking old recipes does honor cooks from long ago. My grandmother made this. It’s wonderful! This recipe is definitely an old classic. It’s nice to hear that this post brought back some good memories. I remember this dish from my childhood! How fun that you found a great recipe for it! I always have fun trying to decide which hundred-year-old recipes to make. It’s wonderful to hear that this recipe brought back some food memories from your childhood. Like many old classic recipes, there are lots of wonderful versions and variations of this recipe. Each cook that makes it adjusts and adapts it based on ingredients available, food preferences, etc. Oh gosh Sheryl, I have made a version of this so often. I did not remember the fancy a la King name. A great way to use up the leftovers. Only problem if you really love a particular version, it is never to be seen or tasted in the same way again. You didn’t know what fancy food your were eating. 🙂 Recipes like this are flexible – and easily adjustable based upon ingredient availability and amounts – and they do end up with some versions being particularly tasty. I tend to think that this is part of the art of cooking. We’re not going for the standarization (“McDonaldization”) of food, but rather appreciating the variation. Oh my, that sounds delicious. Especially over bread! I’ve never had this but I think my family would love it! Thanks for finding and sharing. It’s tasty. I think that your family would enjoy it. It’s a fairly easy dish to make. I think that they’d like it. You’ve have to let me know if you make it. It’s the perfect recipe for left-overs. It’s good with chicken – and would also work well with left-over turkey after the holidays. My mom also served this dish over toast. Tonight I made your recipe and served it over freshly baked buttermilk biscuits, using up leftover turkey and buttermilk that I had in the freezer. Also added leftover cooked green peas. Recipe is not difficult to make and it turned out great. mmm. . . your interpretation of this recipe sounds absolutely wonderful. Thanks for taking a few moments to let me know that you made the recipe. I always enjoy hearing about others experiences with recipes I’ve posted – and I know that other readers find it really useful to read comments and suggestions from individuals who have made the recipes. My Mom used to make this when I was little, I’m 62 now. I remember a trip to the mountains, a cabin, snow, and Chicken a la King! She always served it over toast. I can’t wait to make this for dinner. I hope that you enjoy this recipe. I like that it is both easy and tasty.